The weather has been absolutely gorgeous since we arrived in Nova Scotia last week and yesterday was another stellar day with lots of sunshine and cloudless sky. Chris's dad turned 81 yesterday and to celebrate we drove out to Harbourville to a great German restaurant called the Schnitzelhaus. We loved the food there last year and decided to go back for an encore this year. There were just the three of us this time and the food was top notch again. I took the above photo last year and gave it to Fred as a 1000 piece jigsaw puzzle which he has completed and glued together. We brought the empty puzzle box with us to show the owner and she was very impressed to see her restaurant made into a puzzle. We all enjoyed the hunter schnitzel with spatzle, potato salad and green salad with apple strudel and coffee for dessert. Fred and Chris also had a tall glass of Erdinger Weisbeir. Our meals were excellent. So good in fact, I forgot to snap a photo before it disappeared. The owner gave Fred a take home container for later though, so I grabbed a photo of it. 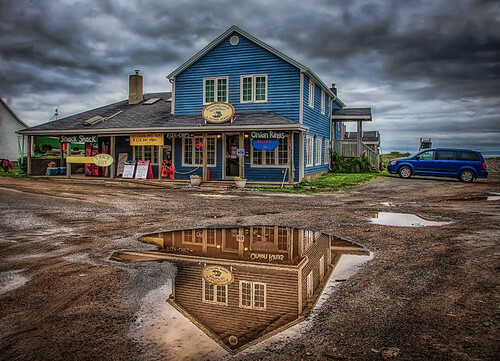 This entry was posted in Entertainment, HDR, Nova Scotia, Photography. Hi we 3 of us were in and had German sausage and sour kraut with potato pancakes first of all the pancakes were terrible they were over cook on one side and raw on the other,the sour kraut was cold. I feel the sour kraut should have been fried in with the sausage and served hot. We were very unhappy with our meal my daughters first time there we also are German and this meal was a shame to serve. So sorry to hear your meal was not great. I hope you mentioned this to the owner. We haven’t tried the sausage, kraut and pancakes but will keep your experience in mind when we go back.